Cuban Tostones and Picadillo...with Milk? Disclosure - This is a compensated campaign in collaboration with the California Milk Processor Board and Latina Bloggers Connect. The recipe and opinions are my own. What goes great with milk? Mermelada de Guayaba con leche. Harina de maiz y azucar! Café La Llave con leche! These are very much like what I would have said, too. I would have also added the obvious. Cookies, for one. Specifically, chocolate chip. Or chocolate cake. While I’m thinking about it, pretty much anything involving chocolate is the obvious milk-pairing choice for me, but that's not important right now. But I was challenged to come up with something that was maybe a little more…unexpected. Wait. I wanted more than just tostones. How about if I made, Tostones with Picadillo? Yes! Picadillo is in pretty heavy rotation around here. IS THERE ANYTHING BETTER THAN TOSTONES WITH PICADILLO?? The juxtaposition of the salty/crunchiness and the savory meat would wash down nicely with a glass of ice-cold milk. Am I right? So, let me review. 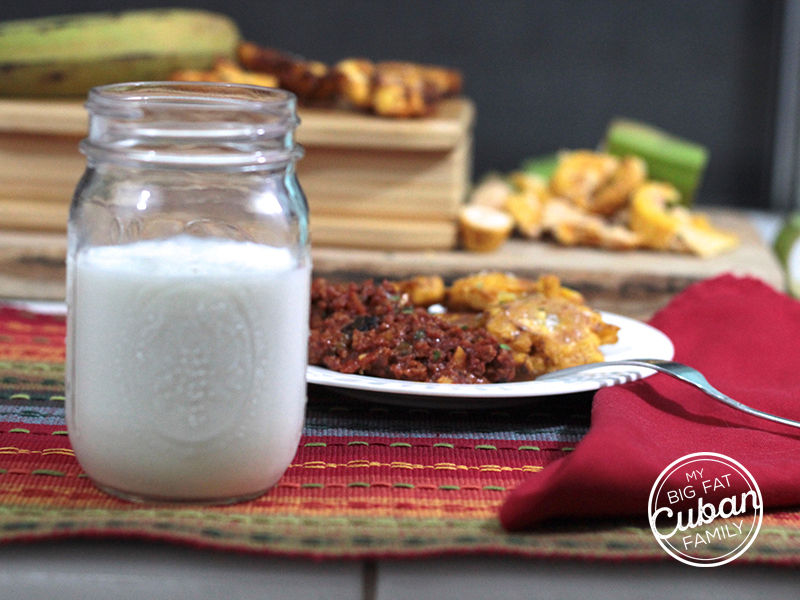 Today we’re going to be making Tostones, pairing them with Picadillo and adding an ice cold glass of milk. You're welcome. My friends over at Toma Leche® have made a series of videos challenging folks to try something unpredictable with milk. I like how they ask the question, "¿Leche Con Qué?" If you're pairing your milk with savory foods, the emulsifiers in the milk attract themselves to the fat, dissolving them and allowing them to go down more easily. Because science. 1) With a sharp small knife cut the ends from each plantain. 2) Cut a lengthwise slit through skin. 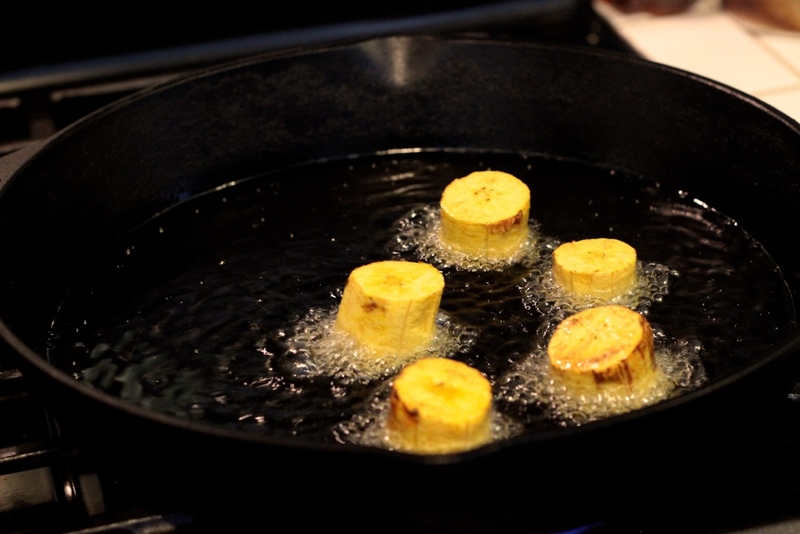 3) Cut plantains into 1-inch-thick pieces. 4) Pry the skin from plantain pieces. 5) In a 12-inch nonstick skillet heat 1/2-inch oil over medium heat until just hot enough that the plantain will sizzle when added. 6) Fry plantains in small batches (DON’T CROWD THEM!) until tender and slightly golden, 2 to 3 minutes on each side. 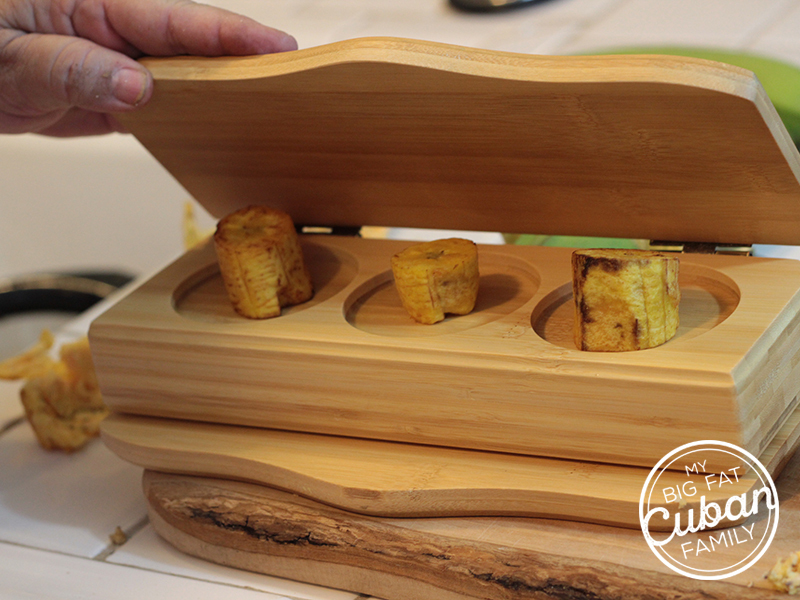 7) Use tongs to transfer the plantains to paper towels on plate. 8) Remove skillet from heat and reserve oil. 9) With the bottom of a heavy saucepan or a wide solid metal spatula flatten plantains to 1/4-inch thick (about 3 inches in diameter). I use a 'tostonera' for this. 10) Dip the flattened plantains Into a bowl of warm salted water, one at a time, and drain them well on paper towels. 11) Heat reserved oil over moderate heat until hot but not smoking and fry flattened plantains in batches, without crowding, until golden, about 3 minutes. 12) With tongs transfer the fried tostones to paper towels to drain and season with sea salt if desired. My recipe for Cuban Style Picadillo can be found here. I think this is a winning combination, don't you? What do you think would pair well with milk? Please head over to My Big Fat Cuban Family Facebook Page and share your photos of your own 'surprising with milk' foods. Use the hashtag, #MeGustaConLeche. To discover some more fun and unusual recipes that go great with milk, please visit the Toma Leche website.